OBH | Print Awards | Lucky 7! we were delighted to walk away from the 2018 South Australia Printing Industry Craftsmanship Awards (PICA) with a total medal count of seven. 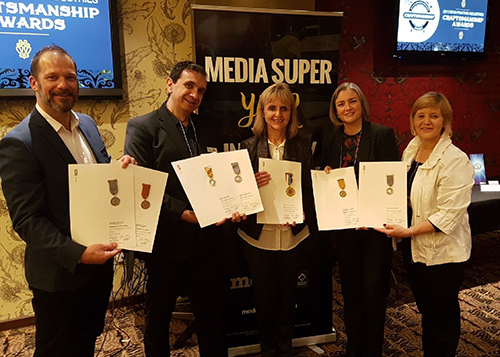 Receiving 1 Gold Highly Commended, 2 Gold, 3 Silver and 1 Bronze during a relaxed ceremony amongst our peers and suppliers at the Hackney Hotel. The Printing Industries Association of Australia (PIAA) CEO, Andrew Macauley and his team presented the awards for all categories. A vision in itself, this magazine-style publication, in keeping with the title, cleverly uses die-cutting and printing of solids on the textured linen cover stock to produce a high quality finish. The uncoated text pages printed in four-colour process are sealed with a velvety satin varnish. For the choice of ink to enhance the design attributes of the publication and the paper selection of a Recycled Board Cover and Laser Text which provides a smooth surface for the four colour process inks, maintaining superior opacity, crisp type and good skin tones throughout. Awarded for the excellent colours and crisp type using four colour process inks on a premium paper, die cut and folded to complete the “stylish brochure”. Acknowledgement that the magazine was produced entirely in-house from photography, video production and design through to print production. For the enhancement of the graphic element on the cover to enhance the logo and title without other embellishments. All of the gold awards are now escalated as automatic entries into the National PICA awards to be held in Sydney in June. We celebrated the significant acknowledgement of our quality with the entire team over morning tea. We are incredibly proud of this result and see it as confirmation of the hard work and dedication of all team members in every department who aspire to get the best results for our clients.